I'm not a huge fan of talking animals. To me, most animal stories come off as silly or out of place. However, there are some stories that do such a great job at building full-fledged animal societies that I can't help but appreciate them. Of course, it helps if they also manage to incorporate some princess mythology. The best show to do this that I've seen is My Little Pony: Friendship is Magic. Unicorns are the next best thing to faeries and mermaids, and no one does unicorn princesses better than Hasbro Studios. The vast world of Equestria is just as beautiful and magical as any fairy tale princess kingdom. The My Little Pony franchise began in the 1980s as a toy line for girls. I even had a couple of them as a kid, myself. The My Little Pony 'n Friends cartoon ran for two seasons in 1986 largely to promote the toy line. It was a bit of a mess, with inconsistent characters and stories. There were a few decent specials, but it wasn't until Lauren Faust gave the the franchise a complete makeover in 2010 that the fandom really took off. My Little Pony: Friendship Is Magic has the DNA of the 1986 series with an much more complex world and six very distinctive main characters that are as easy to relate to as they are lovable. 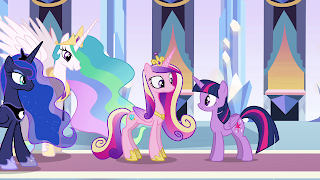 In the early seasons of the show, Princess Celestia and her sister Luna were the two main princesses. There are there different types of ponies in Equestria--unicorns, pegasus ponies, and earth ponies. Princesses are the only ones who embody all three. They are referred to as "alicorns." An interesting thing about Princess Celestia is that Lauren Faust originally intended for her to be Queen Celestia, but Hasbro contested this, claiming that little girls see queens as evil and princesses as good. That's an interesting topic for a future post. Though Celestia is a not a queen by title, she holds the highest ranking in Canterlot. She is a benevolent and graceful ruler who is fully worthy of her title. The season two finale introduced a new princess, Cadence, in my favorite episode, "A Canterlot Wedding." We don't get to know Cadence right away since her identity is stolen by changelings the first time we see her, but it is later revealed that she is the princess of the Crystal Empire, where all the ponies can turn sparkly, like crystals. The main charcter, Twilight Sparkle, becomes the Princess of Friendship at the end of the third season, when she transforms into an alicorn. When this was first announced, Lauren made a statement about wanting to show little girls what it means to be a princess. Instead, it left a lot of people confused. Twilight still lived in Canterlot, where Celestia and Luna were the princesses, but she somehow now had her own magic castle and went on friendship quests assigned by a mysterious holographic map, which also assigned quests to her friends who were not princesses. Even though it left many of us scratching our heads, it's good to know that Twilight's hard work learning about friendship paid off somehow. Aside from My Little Pony's four alicorn princesses, Moondance from Princess Gwenevere and the Jewel Riders is also a princess. This is only relevant in one episode called "Vale of the Unicorns," in which she must save her mother, Queen Sierra by passing an obstacle course. Princess fans love our unicorns. The most famous unicorn story out there would have to be The Last Unicorn by Peter S. Beagle about a unicorn who discovers she is the last of her kind and gets transformed into a human by a bumbling magician. The book was turned into an animated movie in 1982 and did a national anniversary screening tour a couple of years ago. Though the unicorn (later named Amalthea) was not a princess, the movie is considered a classic among lovers of princesses and animation. A question I get asked every so often is whether or not Nala from Disney's 1994 The Lion King is considered a princess. Unfortunately, since she was not born to royalty and married Simba after he was already king, she skipped straight over "princess" and jumped to "queen" (and still wasn't evil). 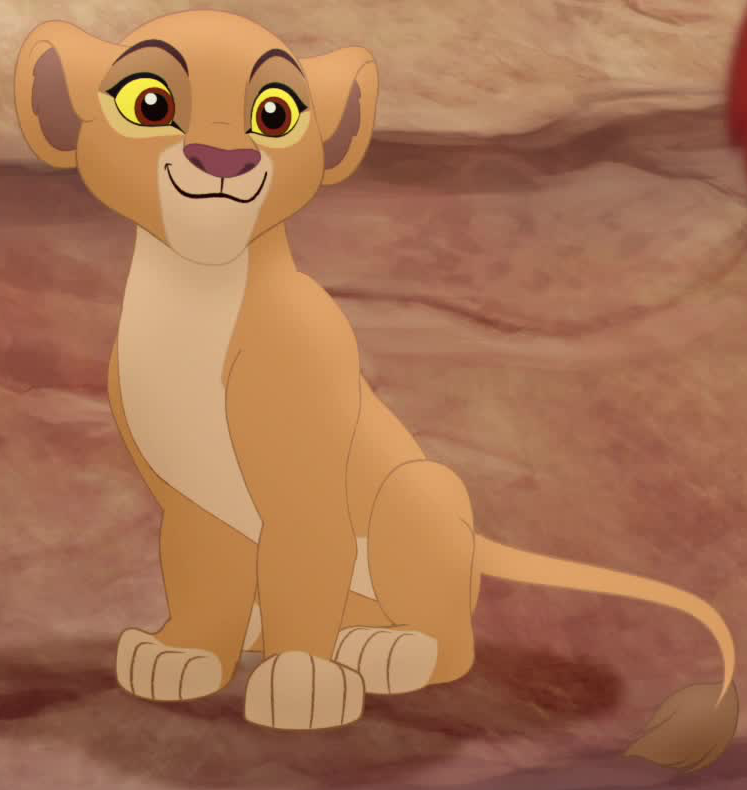 However, the 1998 sequel, The Lion King 2: Simba's Pride, makes it very clear that its protagonist, Kiara, is definitely a princess. 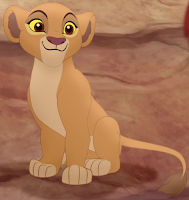 I think Kiara is a terrific animal princess because she is the only one who sees Kovu for who he is and not who everyone tells him he is the adopted son of Scar. She also ends a war between the lions using the power of love, much like Pocahontas had done three years prior. Another regal Disney animal is Maid Marian, a vixen from the 1973 anthropomorphic Robin Hood, but the animals in that movie seemed more like an aesthetic style choice than anything else. There are also plenty of princesses who temporarily became animals. There is, of course Odette from the story of "Swan Lake" who became a swan along with Disney's Tiana and the prince in "The Frog Prince," who became frogs in several different versions. Even Sofia the First became a cat in one episode thanks to the power of a wishing well that her sister Amber found. Many old fables and Brothers Grimm tales are about animals, but it seems like the ones about princesses have passed the test of time the most. People enjoy stories about animals because it's nice to see things from a different perspective from so that we have a better understanding and appreciation of our own lives as humans. Sometimes it's easy to forget about Moondance being royalty. As you mentioned, it isn't spoken of outside of the context of that one episode. And you'd think a royal unicorn would have been bonded with royalty... just my thoughts maybe.